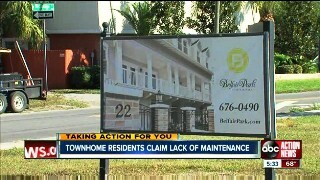 TAMPA, Fla. - Some of the residents who call Belfair Park townhomes home question how their association dues are being spent. Brian Dechane and several of the 10 residents point to the declaration and bylaws that state the developer is responsible for lawn, pool and general maintenance. But they say some of the items have not been maintained in months. Some say portions of their community began to look like vacant lots, yet they claim to pay the developer about $3,000 a month total in dues to cover the upkeep of the common areas. Donna Williams says she and her neighbors repeatedly emailed and called the developer in an effort to get his attention, but communication ceased last October. 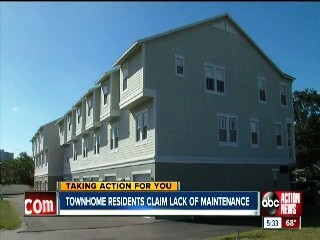 After looking at pictures of unmowed lawns and dirty buildings, I emailed the developer regarding the tenants' claims. Days later, Carlos Cisneros from the Kawama Group responded. He told us in an email: "I have spoken to one of the leaders in our community and have started working this morning on some of the items on the list." Williams confirmed that workers did come out and mow the lawn and had begun pressure washing the buildings. This week, the developer said in an email that he was still working on the maintenance issues, but residents say not enough is being done. may be selected by visiting the supreme court website. Some residents who bought into a south Tampa town home community say the developer has not held up his end of the bargain. They contacted Taking Action Reporter Jackie Callaway for help after getting nowhere on their own.